An anniversary is retrospective by nature. It’s a time of looking back, remembering how things started, and taking note of how far we’ve come. 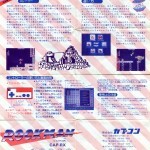 With that in mind, let’s look at what a Rockman game manual looked like 25 years ago. Even from the nineteen eighties, this isn’t exactly what comes to mind when one thinks of a typical video game instruction booklet. I guess it wouldn’t even be right to call it that, since it’s not a book at all. There are no pages, just one big folded up poster with a front and a back. Its uniqueness lends an unusual charm, and it does have a pretty nice overall aesthetic to it. A little heavy on the red and blue, but this thing is pretty cool. It’s like unfolding a treasure map. Unfortunately, as you can probably tell from the scans, folding it back up correctly might take more patience than younger kids often have. My copy is used, and there are deep creases that look like it came from folding along the edges both ways. There are also a few stains and marks here and there. But that just makes it all the easier to tell this was once very loved and well-exercised. Imagining that someone used to carry this around, reading and re-reading it, pouring over the words and pictures over and over again the same way I did with my game booklets when I was a child, makes me smile. 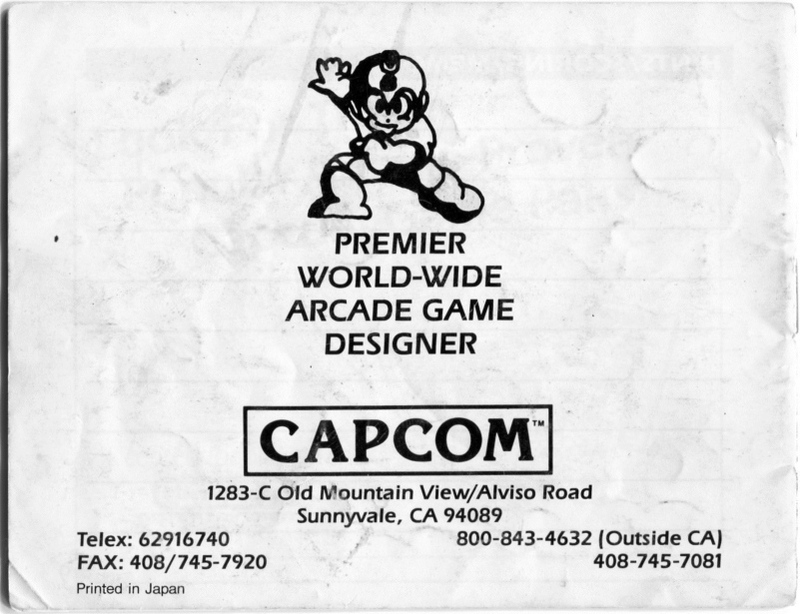 At this time we’d like to thank you for purchasing this Capcom “Family Computer Cassette: ROCKMAN (CAP-RX)”. Please read this Instruction Manual carefully before operating to ensure correct handling and use of this product. Additionally, keep this Instruction Manual stored properly in a safe place. In the year 200X, industrial use humanoid robots have been created thanks to the steady progress of science. Then one day, some shocking news reached the world’s foremost designer of industrial robots, Dr. Right. “Rock” was a household robot whom Dr. Right had always regarded as his own son. Now, in order to stop the 6 robots he had built with his very own hands and to recover each of their central cores, the Doctor has transformed Rock into the fighting robot “Rockman”. Go! Go! Rockman!! 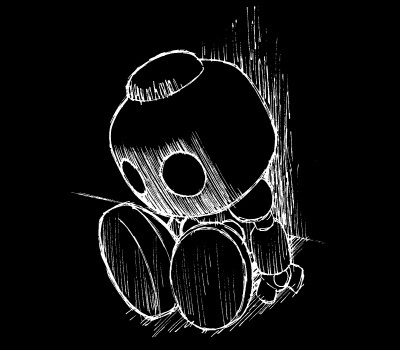 Only you can safely retrieve the 6 robots, then destroy Dr. Wily’s robot factory to restore peace!! At the start of the game, the player has only 1 weapon. As the boss of each stage (stage 1~6) is defeated, the player will gain the use of the weapon employed by that boss. *This game is for 1 Player. Please use Controller I. Use the A Button to jump, the B Button to attack. Press the directional pad up and down to move along ladders, and left and right to run in each direction. Pressing the A Button while on a ladder will cause the player to let go of the ladder and fall. Press up or down on the directional pad to grab ahold of the ladder again. The game can be paused by pressing the Select Button, while pressing the Start Button opens the Weapon Select menu to allow for changing out weapons at any time. “Rock”, the first humanoid robot developed by Dr. Right. Built as a prototype robot, Rock was reborn into the battle robot “Rockman” in order to stop the evil ambitions of Dr. Wily. A tireless industrial logging and wilderness reclamation robot. This powerful robot possesses great agility and is highly resistant to wind and rain. His weapon is a boomerang. Designed to be a land development robot. He was built with a special alloy which causes him to be impervious to many weapons. A robot working as a cargo operator in a cold storage warehouse, but this robot was originally crafted for Antarctic exploration. Though he may not look like it, he’s actually quite a formidable foe. Like Gutsman, this robot was created for land development work. The way he tosses those giant bombs of his around, he can be difficult to approach. A robot developed for work in a waste disposal plant. He can melt nearly anything with his flames that reach 7000~8000 degrees. A robot capable of managing the output of atomic energy plants. His razor-sharp judgement and lightning-fast mobility allow him to carry out tremendous attacks! Of all of the robots developed by Dr. Right, he is hailed as the highest technical achievement. An incredible item capable of firing laser beam platforms which can be stood upon! Without this item, it will be impossible to clear the final stage!! There are 2 kinds, large which restores 10 bars and small which restores 2 bars to the respective gauge. Adds a 1000 point bonus for every ball collected, after the stage is cleared. Color will vary from stage to stage. Increases the Player count by 1. Now I am not going to say that one is better than the other. Rather, I think both have clear strengths in certain areas. I’m just going to point out some of the differences. The stories, of course, are famously different. Beyond the “Rockman” to “Mega Man” change, we have the seven empires of Monsteropolis, the “robot-like Humanoids” (instead of “humanoid/human-like robots”), titles like “defender of the universe,” Dr. Wright having Dr. Wily as an assistant… all well known regional story changes that adds more of a classic sci-fi serial pulp fiction/Saturday morning cartoon flavor. The Japanese version is more colorful, though not full-colored. The US version is black and white with the exception of the cover (a version of the box art which contains the color purple). When it comes to operating the controller, the Japanese version is superior. The US version gives false information, including that pressing up on the directional pad will jump and that pressing down will allow the player to duck. The US one also says nothing about climbing ladders, and fails to mention that the Magnet Beam is necessary to complete the game, although it does explain the concept of life energy in far greater detail. The JPN version contains pictures of actual game play; the US version contains no screenshots of the game at all. Item explanations are different. The US version is redundant, going over 5 items twice. It tells specifically how many points a Yashichi is worth (a bold faced lie, it is a recovery item worth no points) but nothing about its energizing effects; the Japanese version simply shows a question mark. Also, despite being more point-system oriented (see next), the US version contains nothing about the Bonus Balls. The US version is more specific about the minor characters and their roles. It tells exactly how many points each enemy character is worth and what stages they are found in. The US ver. clearly shows who is Dr. Light Wright and Dr. Wily. 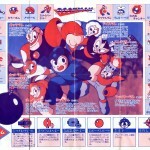 While the Japanese version contains images of Wily in his flying saucer and of Wily’s factory base, it doesn’t clearly label either one so the player can only infer who and what they are. Unlike the US manual, Dr. 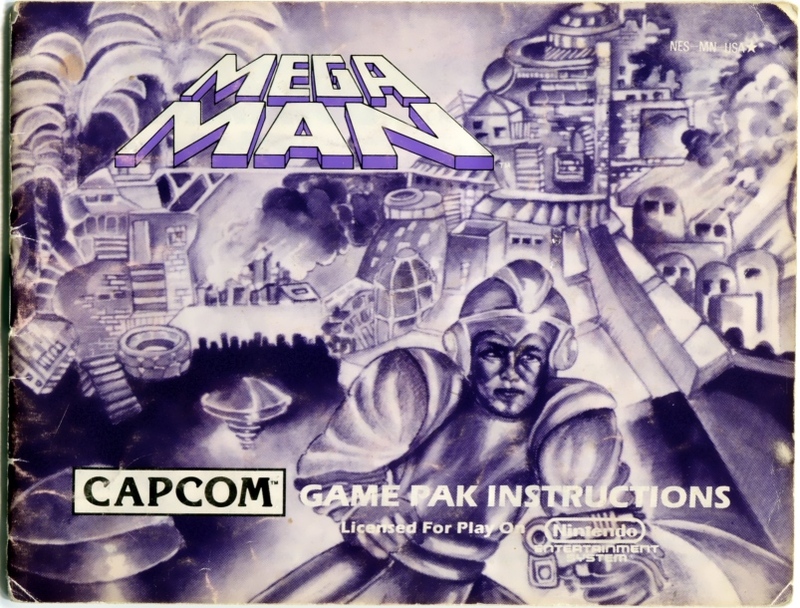 Right is not shown in the Japanese manual at all, and the 6 bosses have no individual images–only a repeat of the box art. The US version contains a page for notes, ads for other games, and a much larger section on warranty & federal compliance regulations. 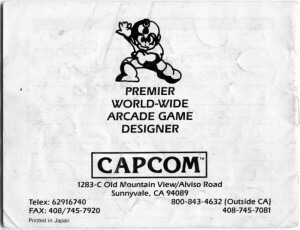 While the FC version contains a rather generic “thank you for purchasing” message, the NES manual features a message from Capcom USA’s then-mascot, Captain Commando ( the original space pimp version, not the Captain EO wannabe) years before he got his own game and became the Captain Commando we know today. Like Benjamin Button or the Hamburglar, he seems to have grown younger over time. But I digress, this isn’t about him right now. Both manual versions serve as testaments to the gaming atmosphere of the times, and help to elucidate the differing marketing approaches taken by the Eastern and Western branches, even when working from what is nearly the exact same game. 6 Comments to "The Rock Manual"
I can’t help but want to read the title of this post as “Rock Manuel,” like the character from The Tick. 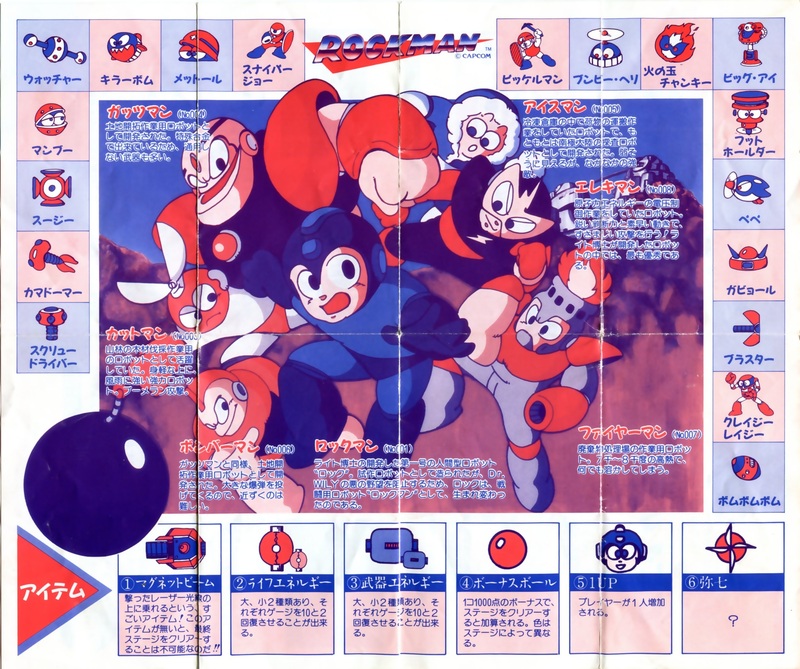 And it’s crazy that the original, er, booklet from Japan left out so much detail, like Light and Wily’s relationship and Roll. I always figured those were in there for sure! Were there any really, REALLY old guides for the game that detailed more of the fiction? Not that I have come across yet. While I’ve no doubt there were a lot of ideas floating around from the staff before that point (especially about Roll and the Right/Wily history), it seems like a lot of the background, characters, and settings really only started getting explored in Rockman 3 & onward. While you could find those details you mentioned prominently in any later compilation (like Mega World or the PS1 re-releases), you know I haven’t found them in any original published materials until 1990. 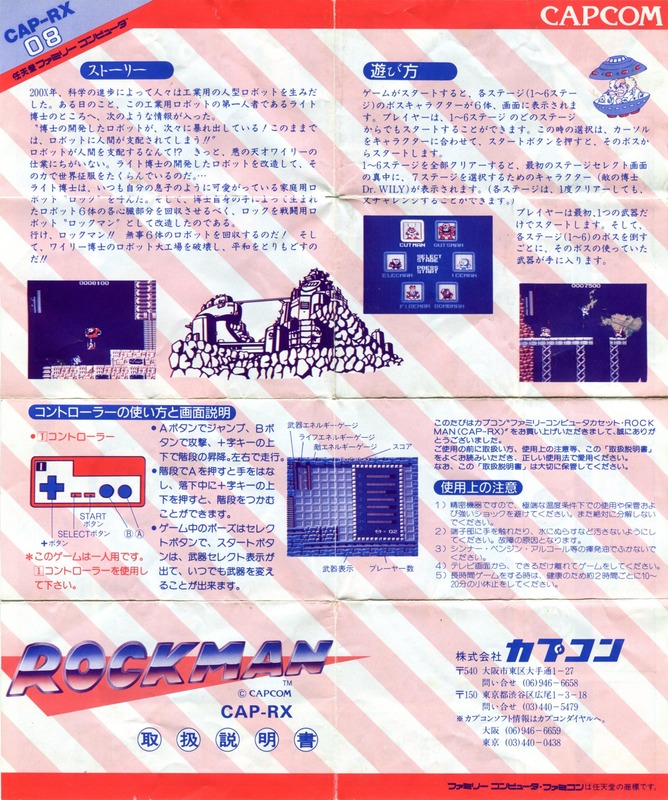 Actually, and I plan to show it later on, the Rockman 2 manual contains even less story and character info than the first. Perhaps from the thinking that it was an action game, and only really required the barest of concepts and justifications to sell? The focus instead was on the game systems and boss design contest winners. Makes sense; I remember the MM2 manual as being pretty sparse for story and character info, too. Amusing to see the (English) manual list Dr. (W)Right under “Evil Empire Leaders”. « Rock’s Top Secret Photos Revealed!